No more reaching or risking a fall trying to board your boat. The EZ Board is the safe answer. The EZ Board is our latest answer to boarding or servicing your vessel from a stable and safe environment. Like it’s big brother, the EZ Board is constructed from lightweight aluminum and can be dry stored out of the way of docking boats. To figure how many planks you will need, measure from the side of your dock to where you would like to board your boat and deduct 6”. The planks used to form your walkway are the same sturdy design as the steps on our ladders. 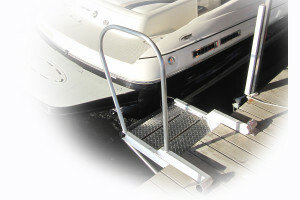 Handrails can be welded on left or right side as you enter your boat. Please specify with each order. Can't find a dealer near you? Contact K&R Manufacturing for direct shipping on bolt together WetSteps. Copyright © 2019 Wet Steps. All Rights Reserved.Website design and hosting by MSW Interactive Designs LLC. We put the web to work for you!